Description: This 4 port USB charger is perfect to charge multiple devices concurrently. 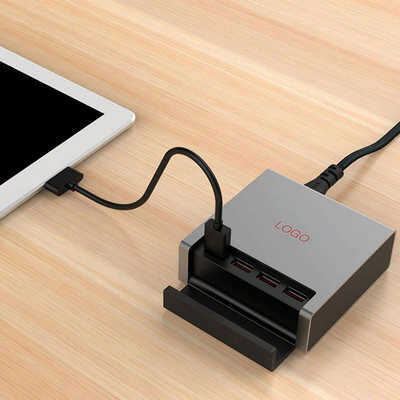 It has a handy cover for the USB ports which folds down to act as a phone or tablet stand. Features: Input: 100-240V 50/60Hz 1A. Output: 5V 2A x 4. SAA and RCM certified. Packaging: Charger is in a polybag which sits in a white cardboard spacer with power cord & instructions presented in a white tuck box with product details on outside of box. Packaging Size: 95mm(h) x 140mm(w) x 72mm(d). Colour: Black Material: Aluminium Product Size: 90mm(w) x 90mm(h) Freight details : 20 per carton, 10kgs, 51 x 30 x 17cms; Decoration Type(s): Colour Print / Full Colour Print / Laser Engrave Decoration Area: Print: 45mm x 45mm. Price includes : 1 Colour 1 Position Print. Setup is included.